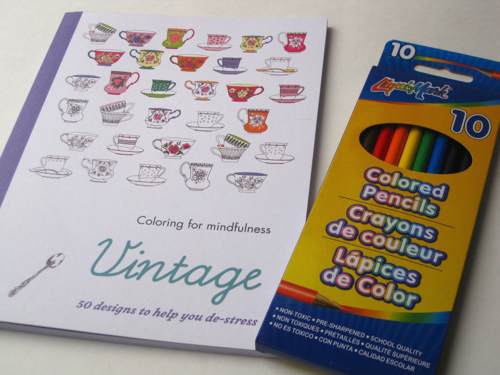 How many of you have joined in the new craze over coloring books for adults? Although I was rather interested, I held out and never bought one of these new coloring books, but then my husband gave me this cute English coloring book for Christmas. I wondered where on earth he found it, and then I learned a woman who works at a local gift shop called him to suggest that he might want to get me this for Christmas and kindly offered to hold one of these for him. I found that quite humorous! 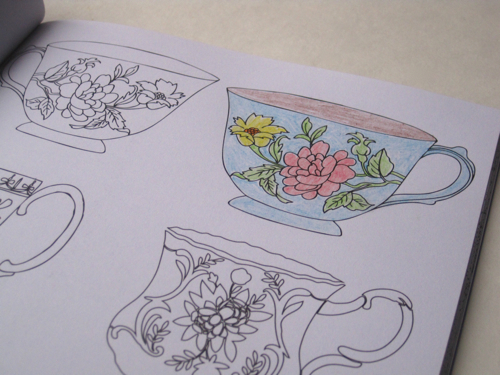 It took me a few days to decide to go ahead and color one of the teacup pages in the book (other designs include vintage furniture, parasols, purses, and more). I haven't colored in ages, but I must admit this was fun! 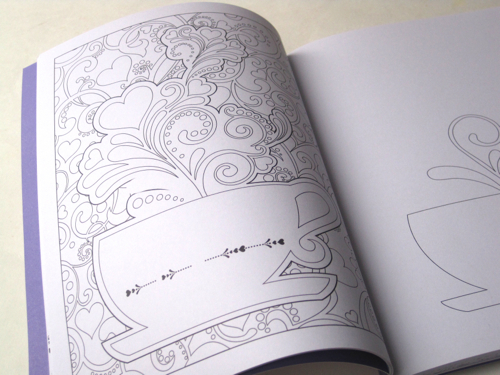 Here's another of the book's teacup designs that I'm looking forward to coloring. I shared a couple of these photos on Facebook this week and was absolutely astonished to learn how many of my female friends had also received coloring books for Christmas. Did any of you? 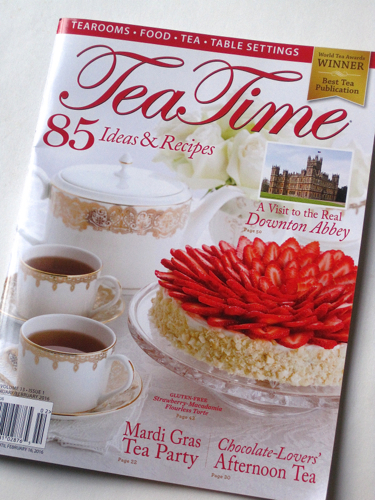 The new issue of Tea Time magazine is simply delightful, and I was thrilled to see "Downton Abbey" on the cover. I'm so eager to see where Season 6 takes the show, and while I'm sad to see it end, I do believe shows are wise to "go out on top" rather than drag something out past its prime. 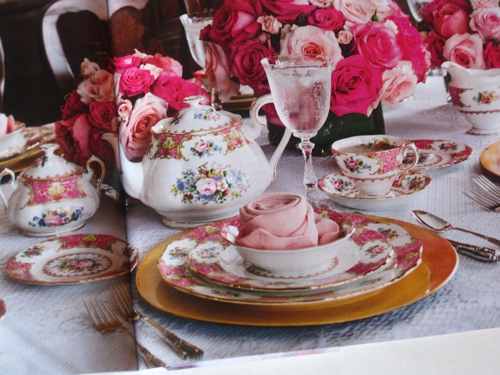 There is always much to ooh and aah over in Tea Time, and this time, I was bowled over by this lavish rose-themed table filled with Lady Carlyle china (I have a teacup!) and with napkins shaped into roses (hey, I did this very thing last month!). 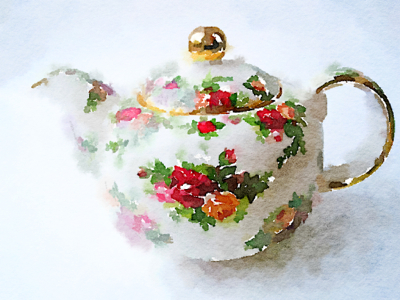 I also greatly enjoyed the feature by Bruce Richardson on "The Tea Things of Thomas Jefferson," partly because my Saturday project this year will focus on tea and American history. But I probably don't need to say any more about that until Saturday, right? 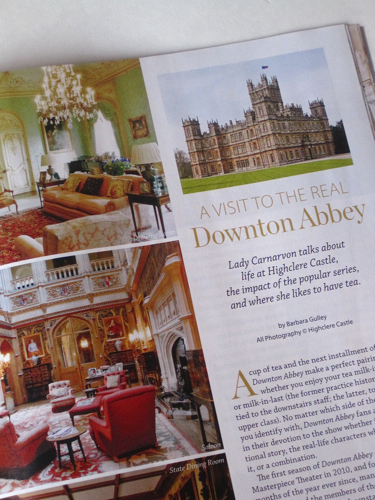 And how happy I was to see this article that included comments from Lady Fiona Carnarvon, the current countess of Highclere Castle, aka "Downton Abbey." I'm so excited about the show's return this Sunday night, and I'm wondering a number of things: How long must we wait for the wedding of Carson and Mrs. Hughes? Will Anna and Bates find happiness? Does Branson leave for America? Those are my top three "want to know" items. What are your top three? Having a cup of cheer! And Bella decorated mine with an "A" and symbols of peace, love, and joy. I love these mugs! They came in a gift basket filled with shortbread, coffee for Pop, a cookbook for me, and a gift certificate for both of us to visit a tea room! The other new tea mug I received was a gift from my husband. While I suspect he gets weary of my correcting the spelling and grammar on the evening news (about which I am not usually silent), I'm grateful he's good-natured about it. Finally, my other "sipping" gifts came from my sister's family. She asked for some ideas of things I wanted, so I happily directed her to Walmart and the Pioneer Woman's beautiful new teal glassware! Pretty sure I'll be using these to serve iced tea and water in the new year. 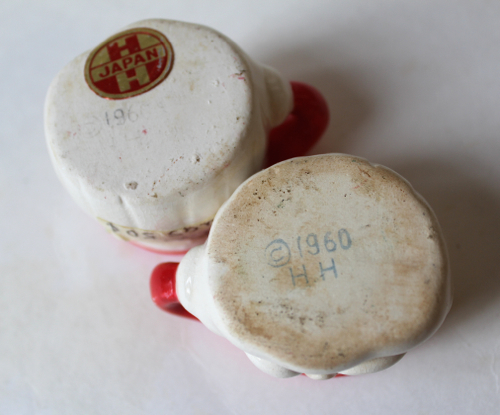 And I don't believe I've ever seen glassware that included a mark like this on the bottom. 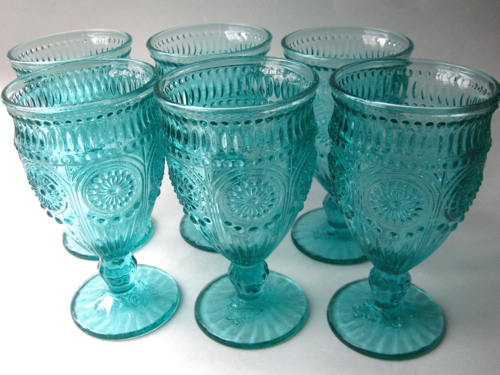 It's nice to know I'll always remember who made (or at least, designed) these glasses! So what tea gifts did you get this year? I always love to hear! Have you used up all the extra Christmas baking ingredients sitting around your house? My Sunday School class occasionally decides to have a potluck breakfast meal together, and while I was happy to learn we would do so once again on the Sunday after Christmas, I knew I didn't have it in me to go to the grocery store again. I had trouble coming up with something breakfasty to make with the ingredients I had on hand, but then I remembered I had some cream cheese and mini chocolate chips I needed to use up. 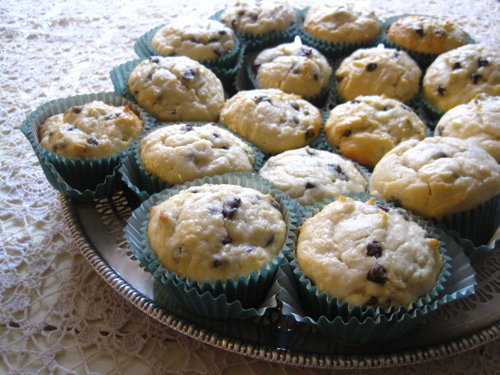 So I looked online to see if there was a muffin recipe calling for cream cheese and chocolate chips, and I found this one. * These turned out so delicious, and I definitely try to file away anything that makes my husband say, "This one's a keeper." 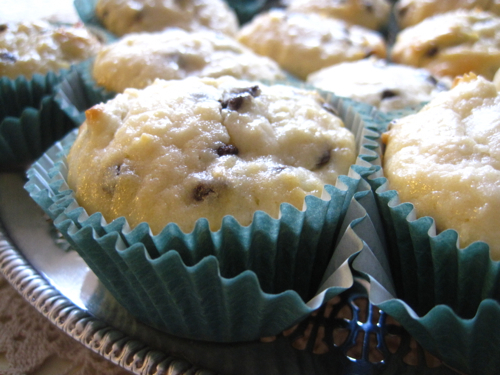 These muffins tasted so rich and creamy, and they were easy to whip up, too! Since I'm already planning my first tea of 2016, I'm thinking I just may make these in mini muffin sizes to serve as one of the sweets at the tea. 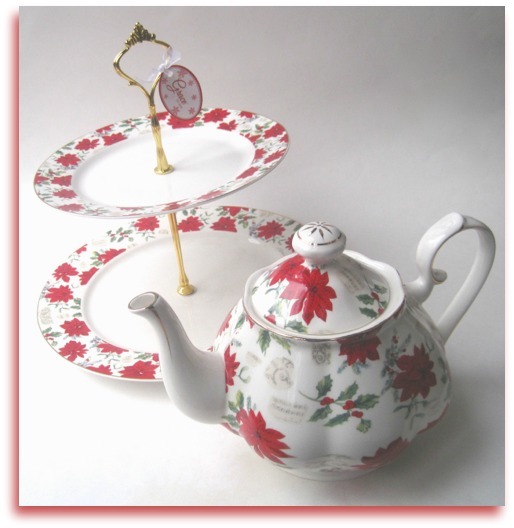 Have you thought about your first tea of the new year yet? I'd love to hear what you have in mind! *I substituted whole milk for the cream in this recipe. 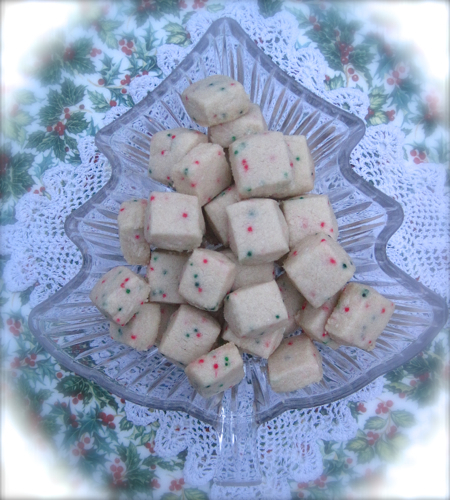 I'll try it with the cream when I make these again, but I would not hesitate to substitute the whole milk, either! I’m not sure I should tell Rick about my latest dream. Ever since Katie and Josh gave me that Old Country Roses tea set for Christmas last year, I seem to have been on a real tea kick, going to tea rooms, shopping for teawares, and sipping more cups of tea than ever before in my life. I can’t help believing that’s one reason tea has been a part of my dreams on quite a few nights this year. Thank goodness I’ve made a habit of writing them down, because otherwise I’d never have recalled all those odd tea dreams of the past year. I remember having that first dream where my teacups were jealous of each other. At least that one made me conscious of switching out my teacups and not using the same old ones over and over. Then around St. Patrick’s Day, I had that vivid dream about leprechauns magically disguising themselves on teacups and traveling to America from Ireland. How bizarre! And just this fall, after I visited Florida and took granddaughter Olivia to see Cinderella at the movies, I dreamed about going to an antiques shop where I spotted a poor but beautiful forgotten teapot and her ugly teapot stepsisters. I can’t believe that when I told Rick about that one, he gently suggested, “Marsha, maybe you need to collect something else — like first edition books.” Sourpuss. Still, I’m glad my daughter’s family got me hooked on collecting teawares, and they have certainly gotten me addicted to “all this tea stuff,” as Rick puts it. He’s just saying that because now I’ve gotten our granddaughter hooked on teatime too. Just as she usually does, Katie arrived early for Christmas, and I was thrilled to have her here, but I was especially delighted to have our adorable grandchildren, Olivia and Ethan. I can’t believe Olivia is three. And it seems like only yesterday I was headed down to Florida and Katie was giving birth to baby Ethan. Five months old, already! I’m not sure I’ll ever understand exactly what Josh does for a living there in Florida — something to do with cyber security — and why he has to come up later in December, but I don’t mind having some quality time with Katie before her husband gets here. 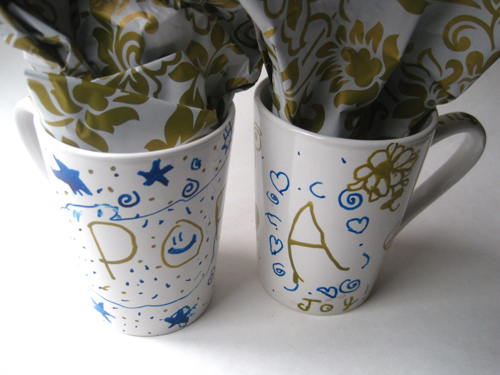 On Christmas Eve, Rick and I gave Olivia a cute little tin tea set in a cardboard case, and after she opened it, she and I had tea together every day until they left. I do enjoy my loose leaf teas, but I don’t think I’ve ever had any tea I enjoyed more than those pretend cups of tea — just regular tap water — I had with Olivia. This Christmas, my heart has been so full. Really, my whole year has been. As I look back at my entries from January, I see I’d forgotten how worried I was about everything. I was worried about the new baby coming. I was worried about not having a long enough list of New Year’s Resolutions. I was worried that I worried too much. 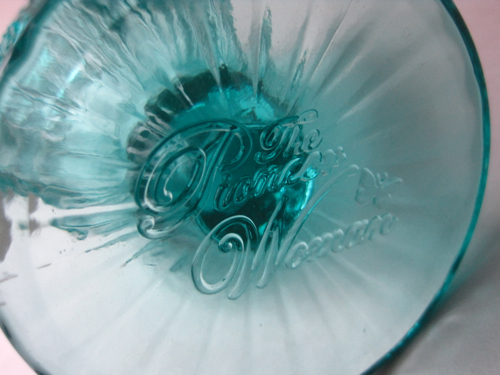 Who was that woman? I don’t miss her. Looking back to one year ago, I think Rick and Katie were right when they said I worried too much. I gave up thinking life is all about racking up accomplishments, and while I haven’t quite conquered all my Type A tendencies, I do think I’m much better about letting things go. Don’t you, Journal Dear? I see I had also vowed not to worry about whether Josh could afford for his wife to be a stay-at-home mom. Whatever his job is, he must be good at it, because he got a promotion, and they bought a new SUV right before the baby was born. So I think I’m probably through making lists of anxiety-producing New Year’s Resolutions, and I’m going to stick with my goal of not worrying about things. Life was so much easier this year. Besides, I like what the pastor said on Sunday about how worrying means we’re having “faith in the negative.” I’ve always said I put my faith in God, and it’s time I started living like it. Finally, Dear Journal, one thing I absolutely do not intend to worry over in the coming year is my newfound passion for teatime. I think I have had some sort of teatime almost every single day of the past year! I always thought teatime had to be a big production with invitations and a guest list. I’ve had some of those, sure, but some of my best teatimes were those quiet moments in the afternoon that I spent with a cup of hot tea, enjoying a book (or writing in this Journal), all by myself. I predict that’s a tradition that will continue for many, many years to come. So thank you, Dear Journal, for joining me on this journey for the past year, and since you’ve still got a few more blank pages inside, I’ll see you in the new year too! How will you spend the day? Is your Christmas Eve a busy one or a quiet one? I'd love to hear how everyone is spending the holidays (or "spent" the holidays, if you happen to read this blog post after the fact). However you spend them, I wish you all a very Merry Christmas! Handmade Christmas gifts from my New York pen pal! 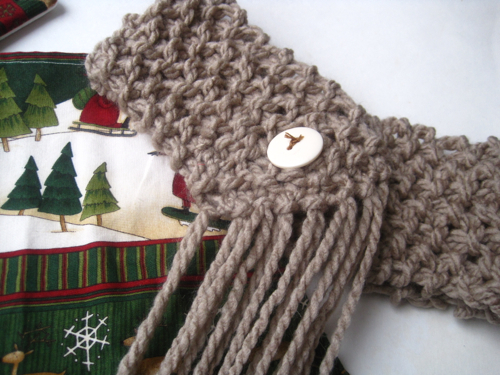 Do you all like to receive handmade gifts for Christmas? I certainly do. 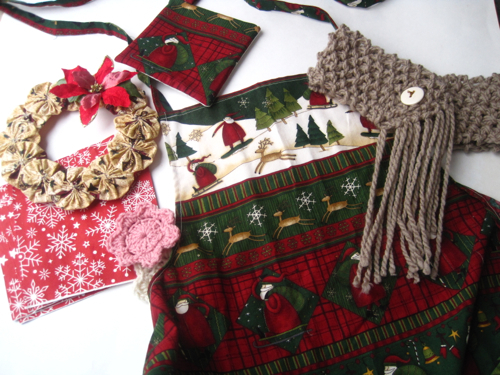 I know from experience how much time and love goes into a handmade gift for someone, so for that reason, I was thrilled when my tea-loving pen pal in New York, Sandy, surprised me with a huge package of handmade goodies for Christmas, including this beautiful new Christmas apron! 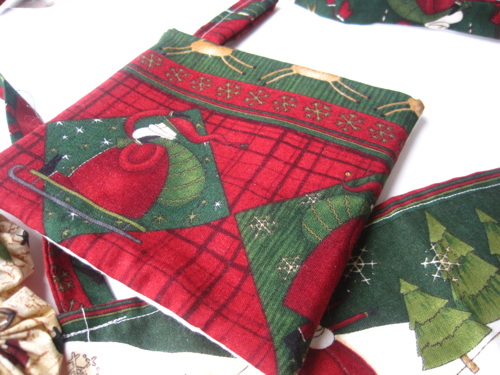 And in matching fabric, there's a mini-potholder, something I have actually wanted for quite a while now. I once had a mini-potholder, just the right size for grabbing a hot handle on a teapot or teakettle, but I accidentally burned mine on the stove, ruining it. I am so happy to have this pretty new one, and I will be using it year-round! Sandy also included this adorable yo-yo wreath. Now I can make yo-yos, so why have I not thought of making a yo-yo wreath? This is so charming! Another gift that will be quite useful this winter is a neck warmer. It's pretty, yes (and the yarn Sandy chose is amazingly soft! ), and even more important, it is just the perfect size for tucking into the big winter coat I will be wearing on my afternoon walks once the weather turns cold. 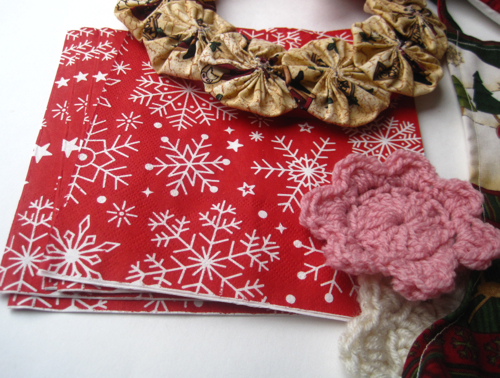 Finally, here you can see some pretty crocheted flowers she included as well as some festive Christmas napkins. Some of our family were here Monday for lunch, and I was looking around for some Christmasy napkins to use when I realized I had these pretty paper ones. Perfect! It was incredibly helpful to have these handy right there at the last minute, so I think I may follow her lead and give friends some pretty napkins next Christmas. As you can see, my pen pal was quite generous with her gifts *and* her time to me! 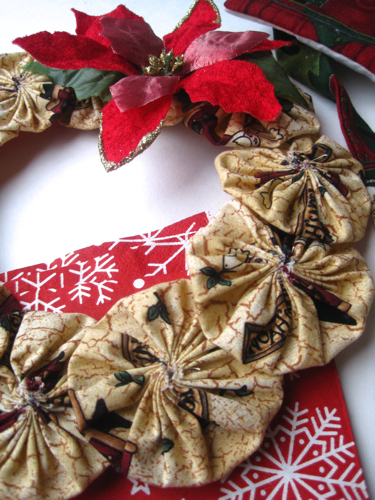 Have you received any handmade Christmas gifts this year? Will you be giving any? A "blue" Christmas of the best kind! It's not even Christmas yet, and I've already been blessed with two lovely gifts from my fellow tea lover Margie in California! 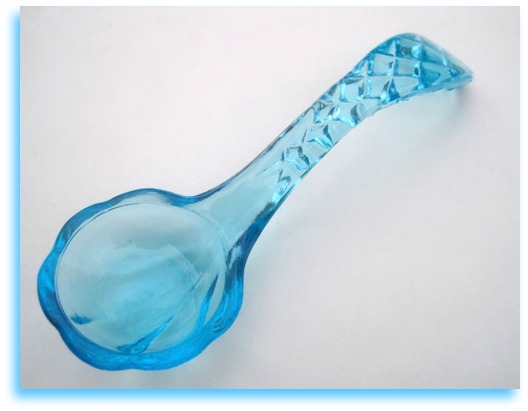 First, this beautiful turquoise blue spoon (a/k/a, "Angela's new favorite tea scoop") arrived in the mail, and I marveled that a) it arrived in pristine condition (it was packaged very carefully) and b) that Margie so thoughtfully remembered my obsession with the turquoise/aqua blue color this year. How lovely! A few days later, I got another package in the mail telling me Margie found some beautiful teapot ornaments when she went to tea recently, and she scooped these up for her tea friends. I am so honored to have received one! Thanks again for thinking of me, Margie! 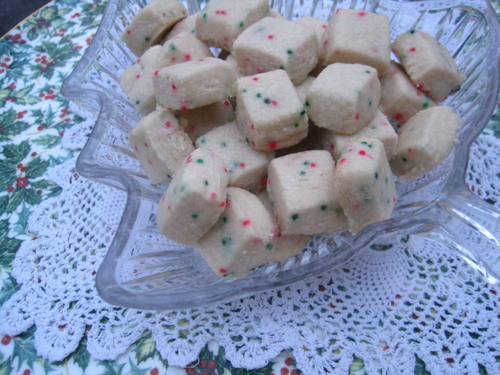 I have made probably a half dozen different shortbread recipes in recent years, but these Shortbread Bites from Good Housekeeping are some of the most delicious bits of shortbread I've ever had! They are incredibly easy, and the recipe is here if you're looking for a fast sweet treat for teatime this week. 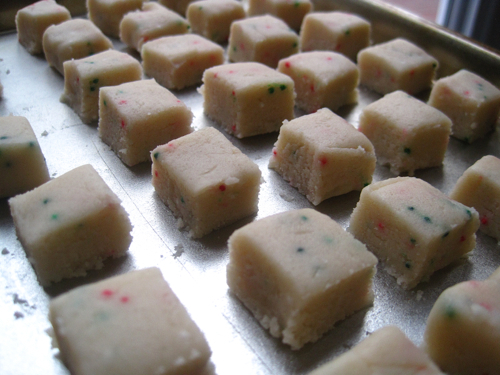 Flour, sugar, butter, and colorful nonpareils. If you've got those ingredients on hand, you're good to go. I popped about five of these things in my mouth within minutes of getting them out of the oven, and I'd probably have eaten more except that I'm saving them for a family visit! I love the way these turned out, and it's occurred to me that by changing the colors of the nonpareils, I could make these for Valentine's Day, St. Patrick's Day, July Fourth, Thanksgiving and more! Mary woke at five a.m., just as she did almost every day of the year. Bill was still fast asleep, so she reached for the worn burgundy leather Bible on her nightstand and quietly headed up the hall and into the den. With her new red velvet ballet slippers warming her cold feet, she went to the kitchen and filled the electric teakettle with fresh water. 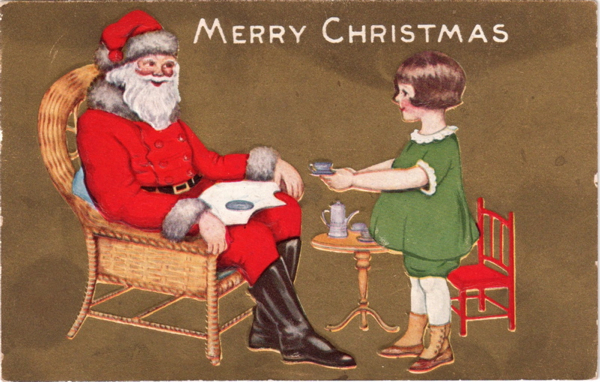 It was a tradition of hers, beginning Christmas Day with a cup of tea and God. For some thirty years, she’d been adding pieces to the same Christmas pattern she had started collecting as a young bride. The warm ivory tones and the cheerful Christmas tree design always brought a smile to her face. 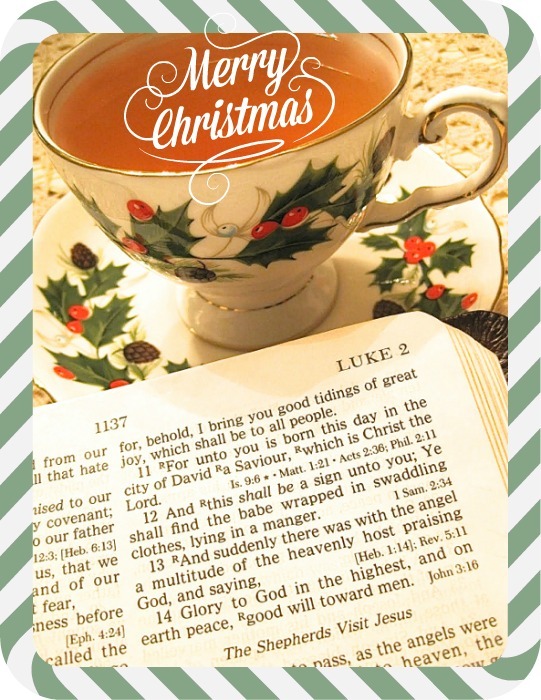 After steeping a cup of her favorite peppermint-flavored black tea, she headed to the sofa, spread a fluffy green Christmas throw over her lap, and opened her Bible to the second chapter of Luke. 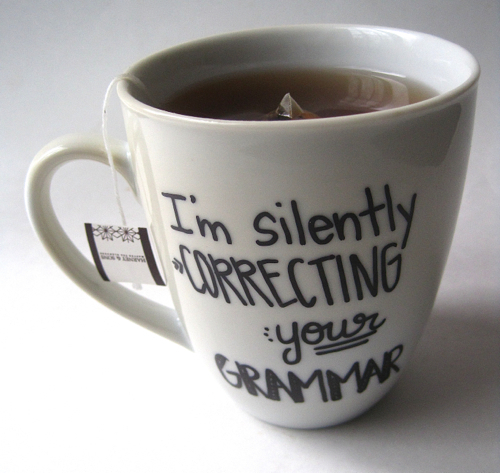 She read the familiar words as she sipped her tea. And it came to pass in those days, that there went out a decree from Caesar Augustus, that all the world should be taxed. (And this taxing was first made when Cyrenius was governor of Syria.) And all went to be taxed, every one into his own city. And Joseph also went up from Galilee, out of the city of Nazareth, into Judaea, unto the city of David, which is called Bethlehem; (because he was of the house and lineage of David:) To be taxed with Mary his espoused wife, being great with child. And so it was, that, while they were there, the days were accomplished that she should be delivered. And she brought forth her firstborn son, and wrapped him in swaddling clothes, and laid him in a manger; because there was no room for them in the inn. And there were in the same country shepherds abiding in the field, keeping watch over their flock by night. And, lo, the angel of the Lord came upon them, and the glory of the Lord shone round about them: and they were sore afraid. And the angel said unto them, Fear not: for, behold, I bring you good tidings of great joy, which shall be to all people. For unto you is born this day in the city of David a Saviour, which is Christ the Lord. Syria. Taxes. Fear. And courage. The topics were just as relevant two thousand years later, Mary thought. But she pushed all the recent news headlines out of her mind and tried, as she often did at Christmastime, to focus her wayward thoughts on the life-changing gift of the Christ child. Earlier that week, she’d reread a favorite piece by a favorite author, Max Lucado, in which he’d pondered “Twenty-five Questions for Mary.” He meant the other Mary, of course, but she always chose to imagine Max had intended the questions for her too. Her favorite was the one that read: “Did you ever think, That’s God eating my soup?” So practical, yet so thought-provoking. And like Max, Mary wondered if Mother-of-Jesus Mary thought about the food she was serving to the son who was also her savior. And then she whispered, Thank you, Lord. 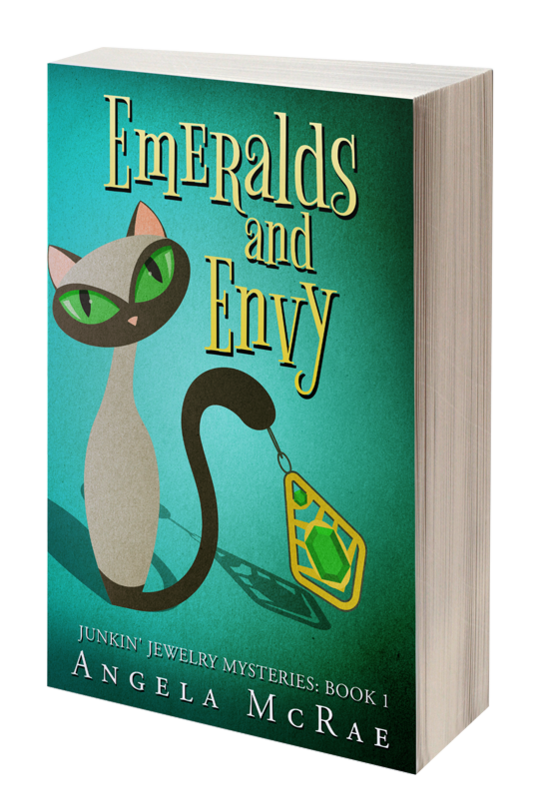 Snuggling beneath her green throw, Mary took a sip of tea and stared at the amber brew. She knew she had a full day ahead. In a few minutes, she would put the ham in the oven to bake. 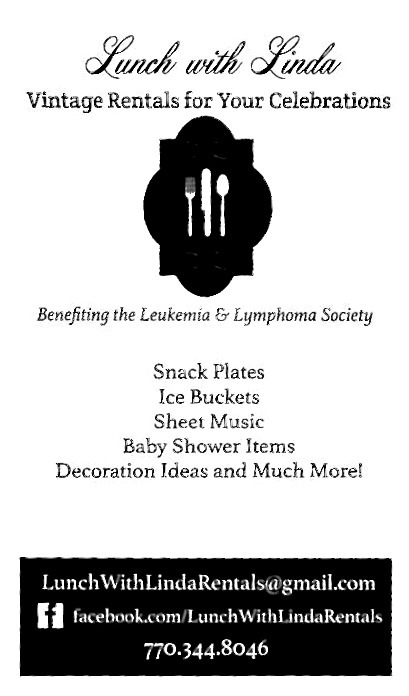 Then, she’d throw a few things in the crockpot to have appetizers ready when the family showed up at lunchtime. Her daughters and daughter-in-law would help with the casseroles and vegetables, and then they would enjoy opening presents together before enjoying their traditional Christmas dinner. 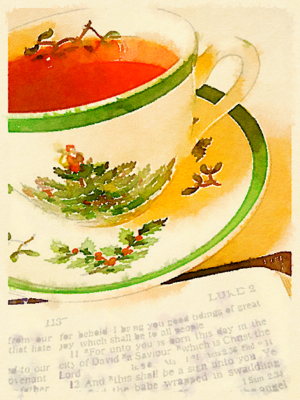 Finishing her peppermint tea, Mary let her eyes scroll again through the passage in Luke. How fortunate she was to live in a day when her Messiah had already come, had already offered her the magnificent gift of eternal life. She knew that later that day, she was likely to open gifts that brought her much pleasure. A new bathrobe, perhaps, or a teacup or two for her collection. The grandchildren might give her a new photo book for the year—always a favorite gift—and Bill might surprise her with that new electric tea kettle she’d been hinting she would like. And however her Christmas Day ended, she knew nothing would top the fact that it began, just as always, with good tidings of great joy. Some of you longtime readers may remember the year I decorated my entire Christmas tree using Santa mugs as ornaments. (Photos here.) I had lots of fun doing that. In fact, I did it again Sunday night, but it was late in the evening when I finished, so I thought I'd wait until the next day to take a photo of the latest Santa mug tree. Bad choice. We had just gone to bed for the night when we heard a horrendous crash and clanging from directly below us downstairs, right where the tree was. With a sigh, I headed downstairs to inspect the damage. Would you believe not one mug was so much as chipped, and there were probably sixty- or seventy-something of them on that tree? Not. One. Broke. Isn't that miraculous? Turns out, the weight of all those mugs caused the tree stand — this one actually joined to the tree itself — to shatter into pieces, so that tree is now toast. I plopped up my retro aluminum tree instead, and while I'm sad the Santa mug tree didn't last even 24 hours, I'm happy I didn't lose any mugs in the process. And if you'll permit me one more Santa mug post this week, I discovered something about this one when I was unpacking the mugs that I thought was rather intriguing. 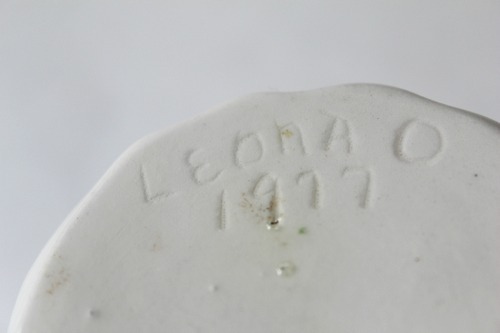 "Leona O, 1977." Was Leona the grandmother or aunt, maybe? 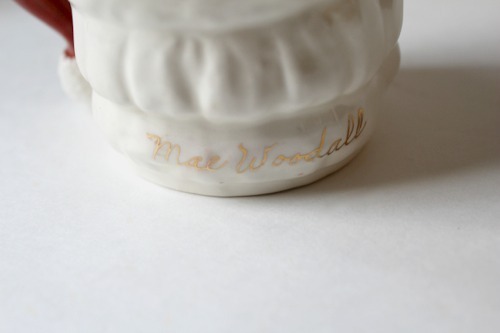 Was Mae Woodall her granddaughter or niece? Or maybe Leona was Mae's nice neighbor lady who took up ceramics as a retirement hobby back in the seventies. How did the mug end up in my collection? I don't remember buying this one myself, so it had to have come from a friend or family member. 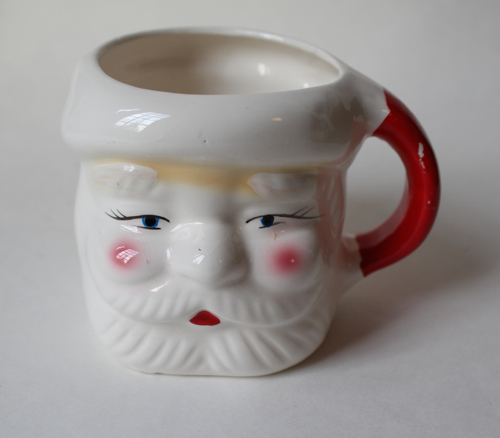 Emilie Barnes wrote "If Teacups Could Talk," but right now, I wish this Santa mug could talk. 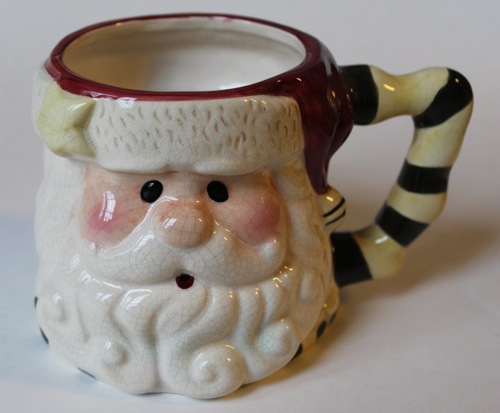 At any rate, it survived The Great Tree Crash of '15, so that's yet another fun fact in this Santa mug's life story! I know better. A few months ago, I saw the prettiest sugar and creamer at a T.J. Maxx in this charming Christmas chintz pattern from Grace China. It wasn't expensive at all (just $4.99 per piece, I believe), but I didn't have anything else to match, so I left the set. A few weeks later, I found this teapot at another T.J. Maxx. I went back to the store where I'd seen the sugar and creamer, but alas, they were gone. 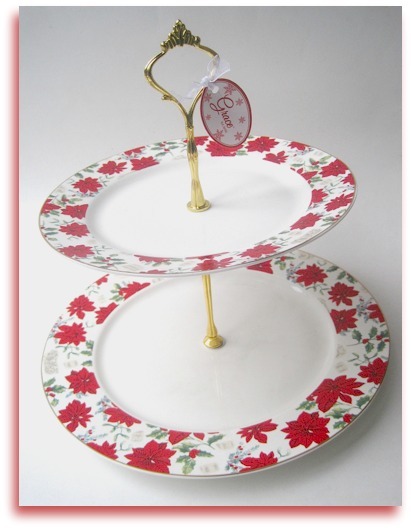 Then this weekend, I found something I've certainly not come across before, a two-tiered server in the same pretty Christmas pattern. I turned this (large) piece over expecting it to say $24.99 or so. It was just $12.99, so into the cart it went! 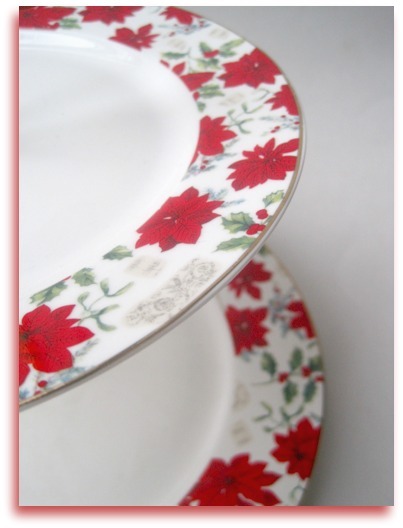 I do love this cheerful pattern with its bright poinsettias as well as the bits of graphic images scattered throughout. But guess who's kicking herself now for not buying that sugar and creamer? Next year, if I see something like that in October, I do believe I'll go ahead and buy it and hang on to it until December! 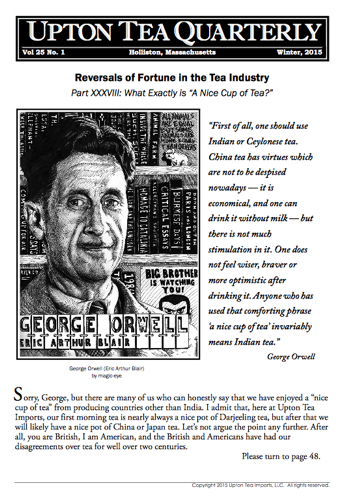 "First of all, one should use Indian or Ceylonese tea. China tea has virtues which are not to be despised nowadays — it is economical, and one can drink it without milk — but there is not much stimulation in it. One does not feel wiser, braver or more optimistic after drinking it. Anyone who has used that comforting phrase 'a nice cup of tea' invariably means Indian tea." Now I have certainly enjoyed plenty of Indian tea over the years, but I can't quite imagine limiting myself to only Indian tea. Can you? For some reason, this quote has taken root in my head, and I've been pondering which country of origin I would choose for my tea if I were limited to one. India would give me those great Darjeeling teas, but think of all the great Chinese and Japanese teas I'd miss out on! I'm trying to remind myself that I am certainly able to drink tea from anywhere I choose, but still … if we had to pick one tea-producing region … could you? Would you? 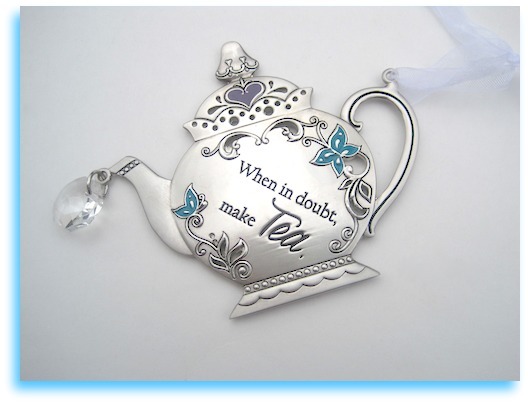 I'm always so grateful to get shopping alerts from my tea-lover friends, and earlier this year, I got one from Joy letting me know that Hallmark had a new mini ornament she thought I might be interested in. She was right! With my love of all things related to Santa mugs, I was smitten by this one-inch-wide Santa mug, definitely the smallest one in my collection. You have to look down on it, though, to realize there's a marshmallow floating on top. 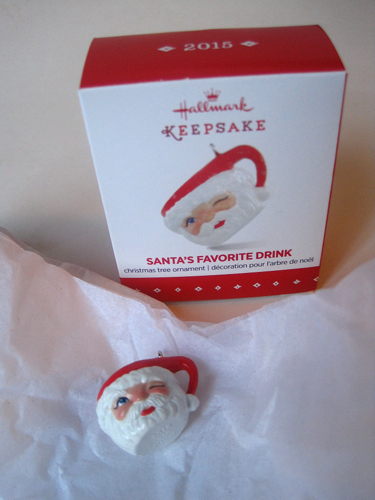 The name of this ornament is "Santa's Favorite Drink," but I think that's misleading, because I'm not convinced Santa's favorite drink isn't tea! 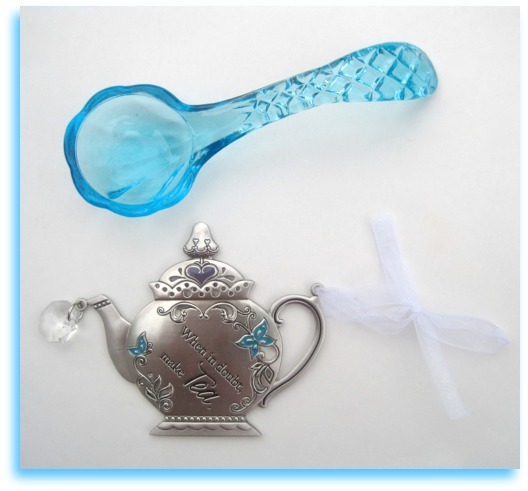 It was also Joy who, last year, alert me to a tiny teapot ornament from Hallmark. So I have two of these tiny ornaments now, and if I get one more, that will make a collection. Do any of you collect tiny ornaments? If so, do you have a tiny tree for them? 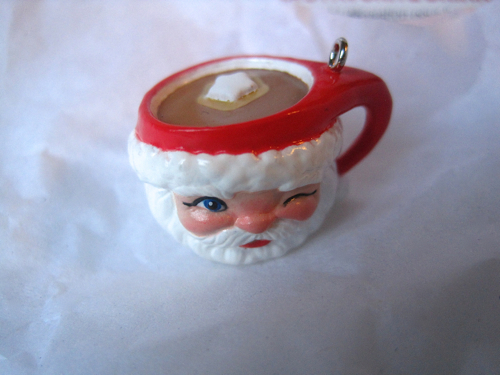 I'm planning to wear my mini Santa mug as a charm on a necklace, but I do like to know what all the display options are! Since I haven't pulled out my Santa mugs in a few years, I decided that this year, it was time to gather them from the garage and attic and see what they've been up to. 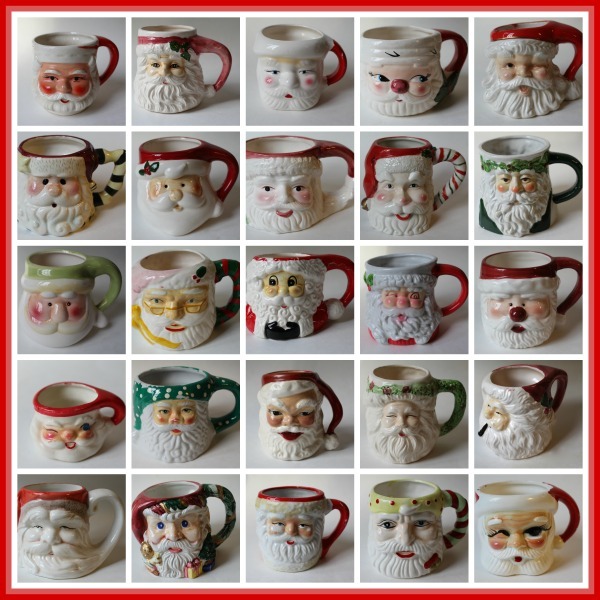 I have a lot of duplicates, but here are some of the 150+ Santa mugs I've gathered over the years, thanks largely to my late mother (who found them for me at Goodwill and yard sales), my friends, and other family members. The other week when I wrote a Saturday Teatime Tale about a Santa mug collectors' convention, Michele asked what my inspiration was for that story, and of course it was these mugs. Although I can't find that such a thing actually exists, I do wish there was a collectors' group so I could learn more about them. I don't believe any of mine are really valuable, but of course they hold lots of sentimental value for me. 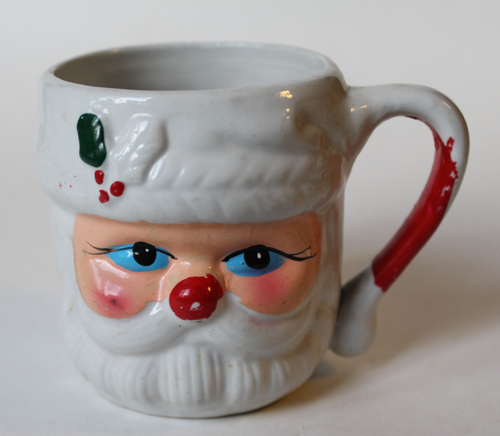 This one is what I consider the "classic" Santa mug, definitely the most common style and one I often see at Goodwill and antique stores. When I see these marked $10 or so, I think, "Good luck," because most of mine were 25 and 50 cents! I believe this is one of the mugs that actually began the collection. One day, my friend and co-worker Nichole heard me say how cute I thought the Santa mugs were in the window of the antique store across from the office where we worked. She bought me two of them that year, and the collection took off from there! Last year, Margaret in Canada surprised me with this one, one of the nicer, larger mugs in the collection. His yellow and black striped handle makes me think of my elementary school mascot, the Buchanan Yellow Jacket! 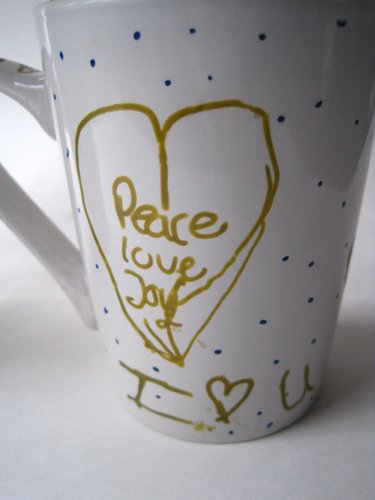 Santa mugs don't often have a backstamp, although sometimes I'll find a sticker still attached. 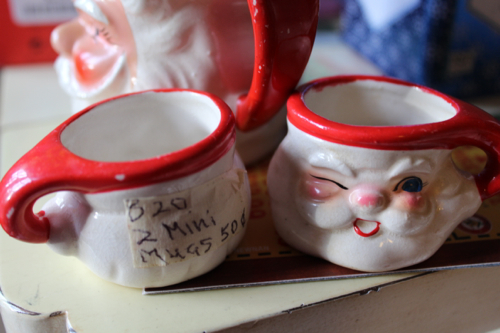 Several years ago, another thoughtful blog reader sent me these two mini Santa mugs, and she left the 50-cent price tag on because she knew that would make me happy. It did! 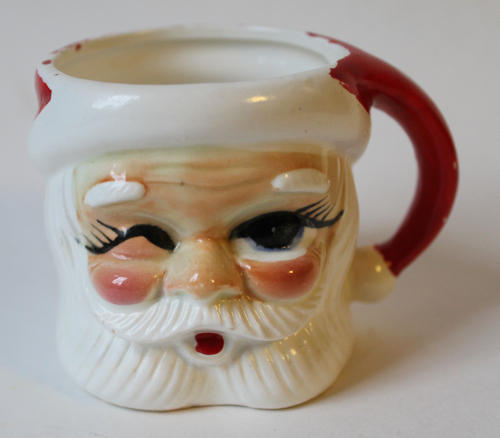 And while I'm very thrifty with my Santa mug collecting and don't just have to have every Santa mug I find, I must say I am charmed when I find one that is different from the others I have. 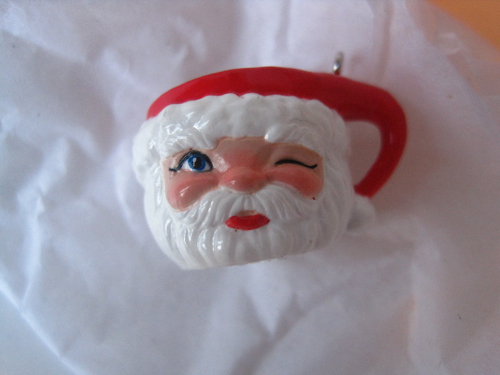 This little guy was 99 cents at a Goodwill in Smyrna on Saturday, and he is what they call a "winking" Santa mug since one eye is closed. He also looks a little cross-eyed to me, but still, I think he has character. And yes, I do drink tea out of my Santa mugs, because there's no law that says you have to use them only for cocoa. 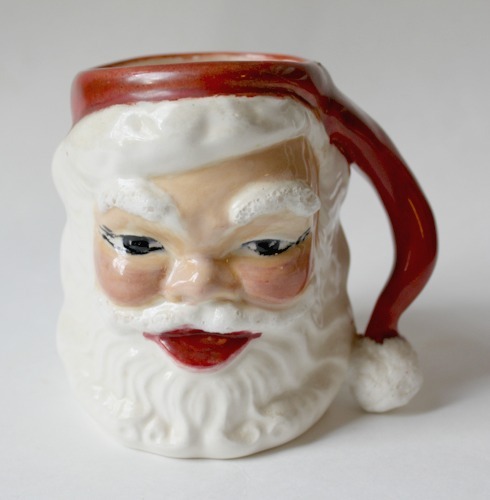 Do any of you have any Santa mugs? I'd love to hear about them! The Tea Society had just left my house after our annual Christmas Tea, and my dear friend Mary Lou Carter had stayed behind to help with cleanup. But first, I prepared us a nice big pot of Twinings Christmas Tea. Mary Lou suddenly snorted some tea. She made a mess when she tried to clean it up, thoroughly staining one of my nice red napkins I had so carefully folded to look like Christmas roses. Not that I minded. I always said it was my pleasure to have friends enjoy my nice things. “Then refresh my memory. What was the problem?” Mary Lou said. 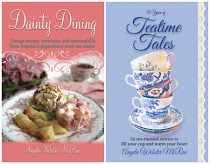 “They advertised my program topic as … high tea,” I said. Mary Lou just shook her head and reached for some of the chocolate truffles left over from the afternoon’s tea. Mary Lou polished off another truffle and wiped chocolate off her fingers with my pretty red napkin. I reminded myself that it was my joy to share my nice things with others. “Hey, is that a new teacup?” she said. 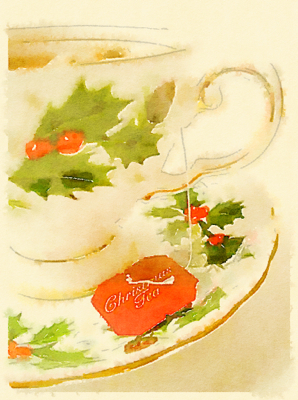 She pointed at my English teacup with holly berries on it. I told her it was an early Christmas gift from Starla, who was thanking me for helping rescue the Christmas Tea. Something about Mary Lou’s attitude had shifted, but I couldn’t put my finger on it. She said she was glad I was “returning to the fold,” but she didn’t seem as happy as I expected that I was going back to being a Baptist. Mary Lou helped me wash and put away all the china, and she gathered up the napkins that had been folded into roses earlier in the day, including the one she had smeared the chocolate all over, not that I really minded. I told Mary Lou I wanted her to sit at the table with Starla and me at the Christmas Tea next Saturday. She said she would, but she didn’t seem too excited about it. “So now you and Starla are tight?” she said. “For heaven’s sake,” Mary Lou said, perking up. I told her we’d be home and would eagerly await the arrival of her famous pimiento cheese. Mary Lou chuckled and hugged me goodbye. “Oh, Brenda,” she said. Sometimes, I almost felt that Mary Lou was just a little bit condescending to me for some strange reason. But then again, I always kept my opinions about such things to myself. Especially at Christmas. Teatime Tale #49 - "Ho, ho, ho! Merry Christmas!"